Ma or Ga and Ni were vakra/varja in the arohana, according to (Muddu) Venkatamakhi. In arohana/avarohana terms the archaic Kambhoji as one should call it, would be defined as SRGPDS/SNDPMGRS. Or to restate, that since Ma was vakra, the aroha can be given as SRMGPDS as well. The ever changing dynamics of our system possibly “linearized”/standardized the older Kambhoji to its modern standard form SRGMPDS/SNDPMGRS. Only Kaishiki nishada was used throughout in the archaic Kambhoji. The usage of kakali nishada in avaroha phrases such as SNPD had not been in currency at least till 1750 as is obvious from the lack of its mention in Tulaja’s Saramruta for example. It’s worth noting that Tulaja mentions about SNP phrase but doesn’t state that its kaishiki. Prof S R Janakiraman² opines that even during that time kaisiki nishada must have been used in that phrase. Is it Ga or Ma, which is vakra/varja in the arohana of the old Kambhoji? Can we safely say that the Kakali nishada usage in Kambhoji was a much latter day introduction? If it’s indeed to be used, how strong/weak is its intonation/usage? SRGMGP – Ma is vakra, but Ga is not. This murrcana is slightly tricky and can be dispensed with in favor of SRGP. Let me hasten to add here that what matters is not the svara and its location per se in the sequence but the tonal color that is imparted to Kambhoji if one were to use the Ga and Ma as vakra in the sancaras. It also proves a point that linearization is not a binding factor for some of the purva prasiddha ragas. Thus for example in Sankarabharana SRGPM can also be a legitimate murcchana & need not signify Bilahari alone , so long it’s sung in such a way (in terms of intonation and sequencing of the succeeding murcchanas) that the flavor of Sankarabharana is not lost. Similarly the SRMG usage need not bring Yadukulakambhoji here, for the madhyama intonation and the way the purvanga gets structured finally is different for both the ragas. I will revert back to this point in the end of this post. So now the question in corollary would be that if SRMGPDs was indeed the melodic contour of the archaic Kambhoji, is there a way to have of a glimpse of that old form which was not lineal in its purvanga? Today, much of the Trinity’s compositions are being rendered in the modern flavor of Kambhoji and hence it “may” not provide us a complete view of the older Kambhoji. Based on available data, one can conjecture that by even 1800’s Kambhoji’s metamorphosis into its modern lineal form was complete. But luckily for us, Subbarama Dikshitar in his magnum opus SSP has documented the notation of an Ata tala tana varna in Kambhoji “Intacalamu” of Pallavi Gopala Iyer (circa 1800). Coming as it does from the post 1750’s, this varna offers us a splendid ringside view of the old Kambhoji. It is indeed fortuitous that the original varna had also been part of our oral tradition. Also varnas have always been traditionally considered by us as repositories/examples of raga lakshana. And thus our analysis of Kambhoji’s musical history/lakshna would be complete & our 2 questions as above could be answered, if we were to examine and analyze the varna. The Kambhoji varna of Pallavi Gopala Iyer in Ata tala is found notated in the following publications /manuscripts. In the SSP the sahitya reads as “syAmarAjendra vara tanaya appuraya chamdra” ¹. Apparently syAma and chAma seem to be treated as equivalents! Interestingly there is yet another version/patham of this varna where the sahitya is “tulajendra ghanUni tanaya sarabhOjendra”, on the lines of the sahitya of the Todi varna “Kanakangi” with the composition being attributed to the Quartet! Its worth noting here that the composition is not listed in the publication ‘Tanjai PeruvudaiyAn Perisai”. Reference is to Sarabhoji II (1798-1832), son of King Tulaja II (1763-1787) who ruled Tanjore. In the aforesaid notebook of Subbarama Iyer the varna bears the sahitya ‘Sri Kadarajendra kandu Srivara tanaya pura chamdra”⁹, which doubtless gets confusing. Gopala Iyer’s conception of Kambhoji in this smallest Ata tala tana varna is thus defined by the following murcchanas: MGPDS, GPDS, SRMGPDS, RMGMP, GRGS and RPMGS. Rightly so Subbarama Dikshitar highlights these sancaras on the authority of this varna when he gives his commentary on Kambhoji’s raga lakshana in the SSP. The other composition of Gopala Iyer, a kriti in Kambhoji (“Harisarva”) found in the Anubandha to the SSP is also similarly structured without the lineal prayoga SRGMPDS. To the best of my knowledge there is no oral version of this composition. I would be grateful to have a copy of a rendition if available. Also one can see from the rendering in the section below,that the SRMG & other purvanga phrases as seen in the varna do not suggest Yadukulakambhoji at all. Kakali nishada usage is virtually nil or is very alpa occurring in the phrase sNPDs. Prof SRJ opines that even there the kakali nishada is only a shade, occurring as one descends from the tara sadja directly to the pancama without going via the kaishiki nishada -chatushruthi dhaivatha route. The frequency of the note drops in the SP descent to give a shade of kakali nishada, nothing more. First is Prof S R Janakiraman rendering “Intachalamu”. In the first clipping below he first explains the nuances of Kambhoji. He also outlines the confusion around the svaras Ga and Ni being vakra/varja in the shloka as published in the SSP. He delineates in brief the older Kambhoji with alpa N3 and also the uniqueness of this Ata tala varna. He follows up by rendering the varna peppering his rendition with his insightful remarks. Here is the text of the sahitya of the varna as per his patham. (For the svara sahitya and for the muktayi & ettugada svaras, readers may refer to the Sangita Sampradaya Pradarshini, ¹edition published by the Music Academy and also available online here. The notation is also available in full with the multiple versions in the book published by Dr B M Sundaram⁵). During the course of his demonstration, Prof SRJ reminisces how the legendary Alathur Srinivasa Iyer would elaborate Kambhoji. Purva prasiddha ragas like Kambhoji or Sankarabharanam should not be viewed in the context of the modern linearized krama arohana/avarohana regime which is the legacy of the Sangraha Cudamani or the Melakarta system designed sometime during the 18th /19th century. It’s indeed sad that today ragas are viewed as a mere aggregation of notes strictly defined by an arohana/avarohana. The concept of murcchanas and how they need to be sequenced to define a raga has now been lost in our music. Hindustani Music still has as its pivots those very concepts, with terminologies such as calans, pakads etc. The concepts underlying the structuring of these older ragas & the way of understanding them are best illustrated by Dr S Sita ³and by Sri K V Ramachandran⁶. I will quote them verbatim to substantiate my understanding. “…….The chaya or complexion of a raga is a sum total value of many aesthetic factors including the raga form. What is of real significance is not the actual number or quantity of svaras present either in the aroha or avaroha but how the respective svaras progress in their characteristic movement ( calana) gAnakriya in the raga involving arohana, avarohana and combination of both kramas. In this larger sense, the concept of arohana and avarohana is of very little significance. Essentially the nature of the tonal movement or behavior in the raga taken as a whole is the crucial factor. While Dr Sita in her Music Academy lecture demonstration pitches her argument against delineating ragas merely based on the arohana/avarohana as above, noted critic Sri K V Ramachandran takes it one step further in his lecture demonstration, in the same portals of the Academy, some 40 years before her. And both Sri KVR & Dr Sita, in my very humble understanding are spot on! And for Kambhoji and the discussion above as to its raga lakshana as it was once upon a time, their words apply like a glove! The vakra tAnas/sancAras of Kambhoji mandate SRMGPDS. The linearization as SRGMPDS must have been a change effected much latter, probably when we designed the melakarta scheme with its inbuilt rules as to progression of svaras and structuring of a raga via a plain arohana avarohana. The Kamboji tone poem can be delineated as MGPDS, GPDS & SRMGPDS in the aroha phrases. Also as Subbarama Dikshitar mentions & on the authority of Pallavi Gopala Iyer’s varna, other (vakra) sancaras include RMGMP, GPDS, GRGS, RPMGS which constitute the melodic hue of Kambhoji of yore. The Kakali nishada was a much latter addition but alpa in usage. It may not be out of place to mention that the Kambhoji gitam “Mandhara dhara re” composed by Paidala Gurumurti Sastrigal starts off with the phrase sN3P. On a related note, it needs to be mentioned that it would be an exercise in futility to talk about some sancaras belonging to Kambhoji and not to Harikambhoji etc for the simple reason that Kambhoji is much older and much of Harikambhoji must have been carved out latter, from out of Kambhoji’s scalar material. In fact now, one can also convincingly argue that SRGMP being linear/sequential, should belong to Harikambhoji while the vakra sancara SRMGP can be Kambhoji’s & rightly so as it would also help differentiate the 2 ragas much better in the modern context! Ramachandran K.V. (1950) – “Apurva ragas of Tyagaraja’s Songs” – The Journal of the Music Academy, Vol XXI, pp. 107-109, Madras, India. Dr B M Sundaram (1984)- “Mudras in Tana Varnas” -Lecture Demonstration in the Krishnagana Sabha, Chennai – available online here. Determining the authorship of varnas is another arcane area of our musicology. Experts typically look at the internal evidences within the composition such as ankitas ,mudras or colophons ( svanama mudra, raja mudra etc) not only to ascertain authorship and also the period in which they were composed, apart from other attributes. Interestingly , in connection with the use of the raja mudra “krishnarajendra”, it must be noted that we have several varnas with this raja mudra referring both to Mummadi Krishnaraja Wodeyar and his descendant Nalvadi Krishnaraja Wodeyar ( those of Veena Seshanna, Muthiah Bagavathar & K V Srinivasa Iyengar). Subbarama Iyer’s aforesaid notebook has a beautiful Huseni Ata tala varna ( composer not given) starting with the words “ninnu jUci”. The sahitya runs as “….bakthudaina srI rAmarAjendra vara tanaya karnAvatAra srI krishnArajendra gAna rasika shikAmanE…”⁹. Again it can be speculated that this varna should have run as syAma or chama rAjEndra, instead of rAmarAjendra. There is an anonymous varna sporting the ankita ‘krishnaraja’ begining with the word ‘Viribhoni’ in the rare raga Suddha Velavali. In passing, one cannot but help lamenting the fact that such beautiful varnas are no longer in circulation and instead a handful of varnas are reeled off ad nauseum in modern concerts depriving rasikas of the oppurtunity to hear these long forgotten masterpieces, which are also invaluable repositories of raga lakshana. Researchers and performing musicians should actively collaborate to bring these compositions back from oblivion, including the Kambhoji varna under discussion ! 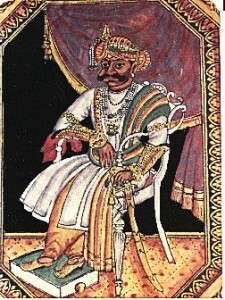 Mummadi Krishnaraja Wodeyar was one of the great patrons of arts and music. One of the modern day Abhinava Bhoja’s, as he is addressed to in some works ! The title of ‘Abhinava bhoja” is found conferred on many Southern Indian rulers and chieftains including King Shahaji and King Pratapsimha of Tanjore, Yuvaranga Bhupati of Udayapalayam, for example. Many musicians were patronized by Mummadi Krishnaraja Wodeyar including Tanjore Chinniah of the Quartet, Mysore Sadasiva Rao & others ⁵.Apart from Pallavi Gopala Iyer, Veena Kuppier has also been honoured by this Mysore King. The rare Begada kriti ‘ Inta parakelanamma’ of Kuppier with its bewitching cittasvara was composed by him on Goddess Camundeshvari during his Mysore sojourn. Again this Ruler and the compositions on him deserve a seperate blog post.